El Dorado County Search and Rescue set up a mobile headquarters across the road from Strawberry Station along U.S. 50. The search for Erin Perkins began around 8 p.m. on Monday June 4. Erin Perkins, 37, was hiking the Rocky Canyon Trail on Monday, June 4 when she lost track of the trail and could not find her way back. At around 3 p.m., knowing she would not reach Pyramid Peak and be back before sundown, Perkins turned around to head home. Throughout the day, she periodically sent her husband her GPS location, but as the day continued, her phone’s battery slowly drained. At about 10:30 a.m. on Tuesday, June 5, a California Highway Patrol helicopter rose into the sky from an El Dorado County Search and Rescue mobile headquarters in Strawberry, California. “I had been listening to music on my phone and when I realized I wasn’t on the trail anymore, I took my phone out but it died right then,” Perkins said. As a seasoned hiker, Perkins knew not to panic. She brought with her extra layers, a mylar blanket, extra food and water and stayed put while the sun went down. 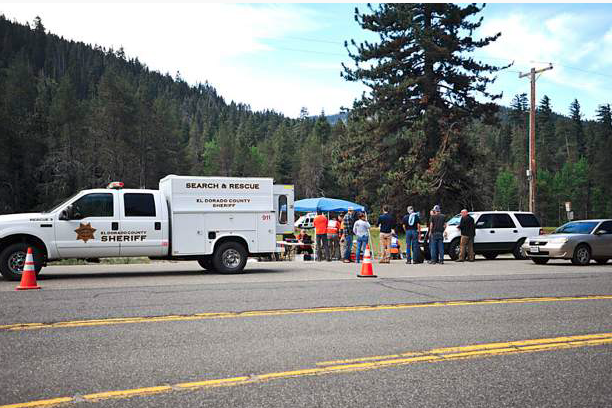 El Dorado County Search and Rescue was notified at 8 p.m., and the search for Perkins began. The ground recovery unit went out first and by the next morning, El Dorado County Sheriff and CHP were notified and brought in to assist. Luckily, by 11:30 a.m. Tuesday, Perkins was found and returned to safety. “I’m honestly embarrassed, I hike all the time,” said Perkins. Prior to losing the trail, she took necessary precautions that ultimately led to her being rescued unharmed and unaffected. Not only did she pack more food and water than she thought she would need, but she constantly notified her husband of her location and knew not to wander once she realized she was lost. If ever lost while hiking, one should also try to seek or make shelter to avoid dangerous natural hazards like rain or heat. Also, officials said to hang colorful items on trees to make one’s self more visible to rescue support. One of the toughest challenges in these situations is controlling panic.